The work in this latest show curated by Rosalind Barker, Sue Evans, and Franny Swann, examines literal and metaphorical possibilities of ‘Fine Lines’. Metaphorical fine lines, whether boundaries barriers or bridges can be elusive, clearly in view one moment, slipping away the next. Therein lies the interest. The creative impulse is to question, re(de)fine the line, burn the bridge, reshape the boundary; a fine line is a provocation. Clare Smith’s piece, ‘Temporary Sculpture’ is sculpture in a similar fashion to which Magritte’s painting is ‘…not a Pipe’. It is a video presentation of a three dimensional work collapsing. As we watch its delicate structure gently ‘tingueling’ before us we lose sight of the video and assume a commonsense connection with what we see happened to the paper structure during the video recording. We are the twitching, vulnerable structure. What happens before our eyes then happens again. And again. And again; the video’s hardware, the imagery before us as light, asserts itself, becomes sculpture of a different kind. ‘Isiah Thrush, toffee mogul in the Black country industrial boom of the Late Victorian era invented the Mobility Stacks for his daughter Esme after a severe bout of rickets in her early years, which stunted her growth and weakened her legs…’ So goes the text which is integral to Ruth Payne’s piece. 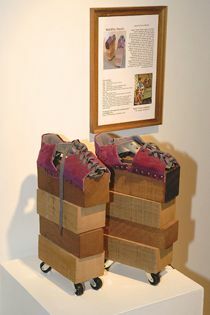 Based upon Isiah’s invention, the tops of pink suede sandals are affixed to stacks of wooden blocks, finished off with casters and displayed on a plinth. They offer roller-skating to madness, a potentially catastrophic solution to disabling disease. (tragedies of Thalidomide and other ‘side effects’ spring to mind ) Esme however apparently flourished using the invention. Ruth Payne’s piece is from her collaborative project with Adam Modley, ‘The Museum of Liminology’. Reality and fantasy spin eccentrically to generate an uncanny imbalance. Coming upon the piece, cold, as it were, the slower minded of us must look twice at least, through that little gap that opens between naïve acceptance and dawning realisation to discover that all is inexactly as it is and not as it might immediately be misapprehended. There is a little of Esme’s problem in Katie Hayward’s work, through which she engages with her perception of herself as relatively short. Earthenware legs hang apparently comfortable in their motionless, possibly powerless state. They are roughly formed from pinched clay, and separated from and connected to a part-torso high above, with long woollen cords. Part of a group of works under the title ‘Prototypes’, the piece concerns the artist’s desire to be taller. At the same time as it hints at the core of impotence within fantasy, its solid presence contrasts with the ambivalence of Clare Smith’s piece. Jenni Burrows’ intimate works ‘Heirloom’, ‘Hand me Downs’, ‘Lost and Found’, are by nature nostalgic. Salt pots, thimbles, a nappy pin, a small button. In each piece, items are held together with a thread, silk, linen, viscose, electric cable. To keep objects conjoined is to keep the memory intact; the thread that connects is easily broken. Our nostalgia perhaps is too a form of denial and selective memory sustained by comforting ties. All these things once were touched and it is the return of touch that we yearn for. Display in perspex boxes amplifies the sense of loss, desire frustrated, so far and no further. Maggie Williams’ ‘Not Forgotten Blue’ is a wall hanging porcelain ceramic piece consisting of 50 sets of about 13 vertibra-like porcelain pieces threaded vertically onto fine wooden dowel, dark coloured beads separating them, hung on nylon thread. They form a roughly rectangular mass with irregularly shaped edges. Ultramarine (?) blue picks out a line of ‘vertibra’ that echo the progress of the top of the piece. If not tending as overtly toward loss and nostalgia as other pieces in the show, nevertheless, if the title is to be trusted, it looks back, through echoes of bone, to the flesh that once dressed them, the blue line reminiscent of an extinct archaeological specimen picked out in a museum display. Dawn Adams’ images of landscape surrounding the Chernobyl nuclear reactor are infused with notions of the sublime. Her works, products of three visits to the stricken site, are stark in their use of the negative. Adams uses traditional film and Photoshop processes. A sky that might have been light on the day is rendered dark, whilst the bark of trees stands bright as though lit from some powerful source. Churned road surfaces announce themselves white. There is inviting stillness in a landscape that offers toxic embrace to those who might visit. Stig Evans’ works cast a sideways glance to notions of the spiritual. Miracle(God Gene VMATZ) and Meme ritual. Miracle (God Gene) is a horizontal dyptich, each half, the remaining (surviving?) half of two airbrushed linear shapes cut along the centre, each offered to the centre of the other like replicating DNA. The dividing cut technique makes apparent familal affinity; (mis)alignment, offset, presents sibling differences, hints at evolutionary processes, spliced genes. Notions of the spiritual cast further sideweways glances at notions of creativity. Oft stated oppositions of the scientific and the artistic sustain a superficial view of the arts as the natural home to ‘creativity’. Such notions as the Meme and the God Gene seem to search for a scientific description of a faith that rather lacks the faith it seeks; faith, necessary to sustain the believer becomes redundant in the face of proof. The somewhat baffling meme demands faith in the existence something that isn’t there? How about genetic atheism? By way of contrast, the works of Shelley Rose, Carole Andrews, Rachel Wickremer, Alison Berry and Fleur Alston are conceptually less complex. Shelley’s three pieces, Orange Rotating, Pink Rotating, Green Rotating, more or less self explanatory, are constructed from circles of colour on a black background. 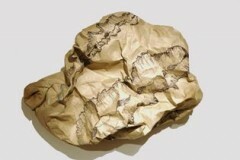 Carole Andrews’ wall mounted rock-like piece, ‘Frustration’ is made from brown paper filled with expanded polyurethane. Not sure of its identity, asteroid or screwed up paper, intention or afterthought, is there a clue in the appearance of what could be the bark of a silver birch, or the aerial view of a rift-valley which meanders on it, drawn in biro and felt-tip? Rachel Wickremer’s crisp paintings on Twinwall polycarbonate sheets exploit space and distance created by the rectilinear tubular construction of the polycarbonate. She paints areas of colour on the back of the transparent sheet, and overlays at a distance of 10mm – the depth of the sheet – lines of colour. The relationship between front lines and rear planes shifts minimally as the work is viewed from different angles. Fleur Alston’s piece from her series ‘Rorschach’ titled ‘Summer Wind and Winter Trees’ is constructed from layers of photographic images of trees, some in leaf, others with bare branches. Initially on large format stock, images are scanned and manipulated in Photoshop, turned sideways, duplicated symmetrically in the manner of a Rorschach inkblot. Fantastical gnomish faces and suggestions of insect forms seeming to be drawn by this conjunction of images. Alison Berry’s monochrome drawing of the Black Watch tartan curiously domesticates the paper Mobius strip upon which it is drawn. The tonality of the drawing fades and deepens as it progresses along the surface, revealing through the act of shading, the woven texture of the paper mould, which in turn emphasises its domestic, tablecloth like quality in a manner that seems perversely at odds with the Mobius strip as form.